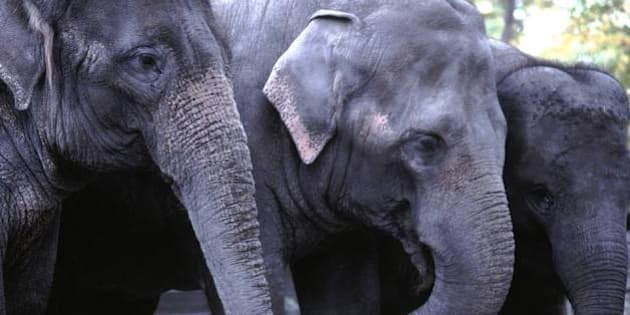 CALGARY - The Calgary Zoo says its three female elephants will make a new home together in Washington, D.C.
Kamala, Swarna and Maharani are expected to be moved to the Smithsonian National Zoo next spring. A male Asian elephant named Ganesh is to be moved to Busch Gardens in Florida later this year. The elephant, who is nicknamed Spike, had been on an extended loan from the Miami Zoo after it was hit by Hurricane Andrew in 1992. Animal rights activists, including retired "The Price is Right'' host Bob Barker, have long pressed for Edmonton's Valley Zoo to relocate its lone elephant, Lucy. The search for a new home for Calgary's trunked trio took months to finalize because of the zoo's stringent welfare-based criteria, president and CEO Clement Lanthier said Tuesday. "It will be a very sad day for our keepers, staff, members, volunteers and community when our elephants leave the Calgary Zoo, but this decision is about them and what is best for their long-term welfare," Lanthier said in a release. "We wanted them to go to a facility where their social group can expand, where they can be part of a breeding program and where they can have greater freedom to spend time in the open air year round, 24 hours per day," said Jake Veasey, director of animal care, conservation and research. Before Kamala, Swarna and Maharani leave, elephant staff from the Smithsonian are to spend time in Calgary to get to know them. Staff from Calgary plan to travel with the elephants and help them adjust to their new home and caregivers. Animals activists in Edmonton have voiced similar concerns about Lucy to the ones raised in Calgary. They want her to be relocated to a sanctuary where she can be with other elephants and in a warmer climate. Zoo officials in Edmonton have said that a move would be too stressful and could even be life-threatening. They have said there will not be any more elephants at the facility once she's gone. The original plan to ship them by air has stalled and zoo officials are considering moving them by ground. Zoocheck Canada says the trip would last about 50 hours. The Calgary Zoo was extensively damaged in severe flooding in Calgary and southern Alberta in June. It has only partially reopened and has had to find new homes for dozens of animals. It has shut down several buildings and has laid off about 300 employees.